Sand Grain Size Chart, Geo Classification Reference Folder - Gilson Co.
HM-510 Sand Grain Size Chart is a pocket size visual soil classification system widely used by field technicians and geologists. Used as a reference tool for describing soil samples and initial site evaluations. It has die-cut cavities filled with precision sieved sand sediment grain particles permanently mounted to the chart. Sand particle sizes are classified according to the Wentworth Scale. 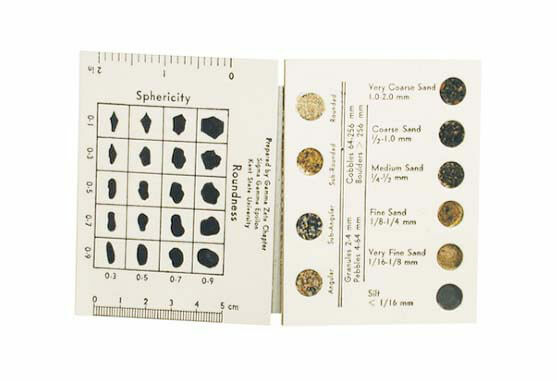 This grain size comparator card identifies sand granules in six sand grain sizes and shapes ranging from very coarse sand to silt sand. Particles are also designated by shape as angular, sub-angular, sub-rounded and rounded. Granules, pebbles, cobbles and boulders are indicated by range of size in millimeter. It also designates scales of sphericity and roundness. The card further indicates well-sorted to poorly-sorted granular materials by diameter, and classified as coarse, medium and fine.